Painted eggs are the symbol of the Easter Holiday. People from Neamt County paint the eggs starting with the last Tuesday before Easter. In villages from Neamt County people also carry with them the painted eggs to the religious service that marks the resurrection of Jesus. Usually the eggs are painted in red, as a symbol of the blood of Jesus. The origins of the painted eggs are lost in time but in Neamt County this tradition is transmitted from one generation to another. In the old times these eggs were also symbols of rebirth and purity and it was also believed that they protect the animals. 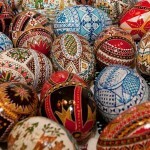 Traditionally the eggs were painted using natural colors obtain from plants, leafs and flowers. The most beautiful technique of decorating the egg is called “inchistrire”. These eggs are decorated using a special technique in which the original color of the egg is maintained. On the egg are drawn different Easter symbols using melted beeswax. Then the eggs are dived into three waters of yellow, red and black color. This technique also uses a tool called “chisita”, which is a wooden stick with a tiny brass funnel at the very end of it. Through the funnel there is a pig’s hair. After the egg is decorated they use a special technique to clean the excess of wax. Eggs are decorated using traditional Easter symbols like: the Easter cross, the pine tree, the bee, the leaf, the fish, the shepherd’s trail or the horns of the sheep. 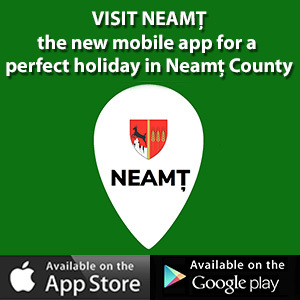 This tradition is carried on especially by the nuns from the monasteries in Neamt County. If you’ll visit Neamt County during this time of year you’ll likely to see these eggs in monasteries.